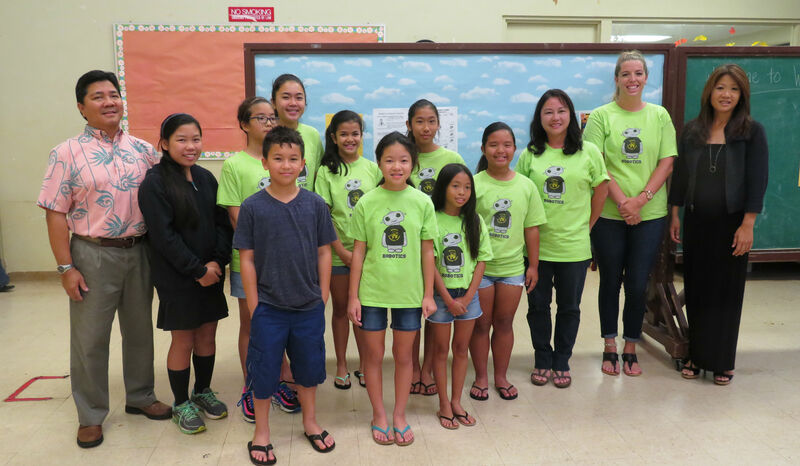 The Pearl City Neighborhood Board recognized Manana Elementary School Hawaii Robofest teams at their April meeting (4/12/2017). Congratulations to Coaches Lynn Okamura, Janet Okamura and Kellie Hatten and their 5 robotic teams for competing in the 10th annual Hawaii Robofest Regional Qualifier held on April 8th at Pearl City High School. Kudos to all the Manana teams with special shout outs to: 1) the Manana Ke‘oke‘o Destroyers who took first and the People’s Choice Award in the Exhibition category and 2) The Manana RoboTeam who received a People’s Choice and Helping Hands Award in the RoboParade category. Special congratz to Coach Lynn Okamura (photo above, far right) who was recognized at the Regional event for her 10 years of coaching service to students at Manana Elementary! Coach Okamura was presented with a certificate and check for $100 during Hawaii Robofest’s 10th Anniversary celebration.